Tired of the “star system” at writers’ workshops? Looking for a place offering time to write as well as fellowship and critique from other professionals? The Woodstock Mayapple Writers’ Retreat may be for you! Designed for the “mid-career” literary writer, the retreat took place at Saginaw Valley State University in Michigan from 2003 to 2011. In 2012, retaining the original format, we moved to the historic Byrdcliffe Guild on Mt. Guardian overlooking Woodstock, NY. 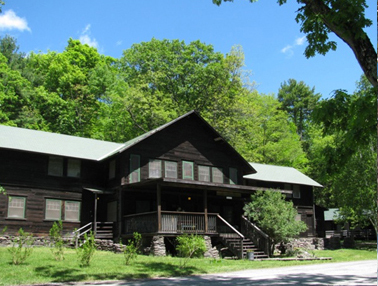 Byrdcliffe, a historic arts colony in the beautiful Catskill Mountains, has hosted such writers as Charlotte Perkins Gillman, John Burroughs, Will Durant, Thomas Mann, Wallace Stevens, as well as artists, musicians, actors and journalists. 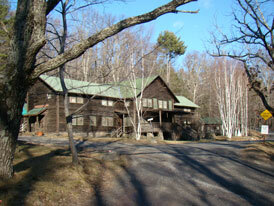 Recharge your batteries, pick up new ideas and techniques, make friends and influence people, write and work with a discerning group of peers at Woodstock Mayapple Writers’ Retreat, a professional-level writers’ retreat and peer workshop with a comfortable, egalitarian atmosphere at a modest cost. 2016 will be the fourteenth year with the same coordinator and format, our fifth year at Byrdcliffe. Each year we have had a mix of about half returnees and half new people. We now offer poetry manuscript critique groups! Who? Writers with significant publications (poetry, fiction, creative non-fiction; see Qualifications section on Details page). What? A professional-level retreat and peer (teacherless) workshop with a comfortable, egalitarian atmosphere. Time to write in pleasant, comfortable, private surroundings. 2.5 hours per day (Wednesday-Sunday) in peer workshop groups of 5 or less; groups may decide to work more than this. Poetry, poetry manuscript, fiction, creative non-fiction or mixed-genre groups available, based on attendees’ needs. Four public readings featuring participants, from Wednesday through Sunday evening (maximum 5 readers per evening). All participants featured in publicity. Public presentations can be given by participants who wish to give them, on topics related to their expertise and interests – if you need a personal invitation in order to secure funding, we’ll provide one. No obligation to present or attend. All participants are welcome to offer their books for sale at events. Maximum enrollment of 18, so register soon! Interested? Check the Details Page for more information or go to the Signup Page for the application form. If you’ve been with us before, please email us for a link to a special page for returning participants. Any questions? Send email to jbkerman@mayapplepress.com or call Judith Kerman at 845-684-5519.